It’s written on the inside cover of The Children of the New Forest by Captain Marryat, a Thomas Nelson and Sons Ltd edition, no print date. Obviously not my book. I nicked it from a family member and it found its way onto my shelves (funny how that happens). It was a birthday present to a very young Neil although I don’t know who from. I just love the smell of that book. Books are quite possibly the best kind of gift. Durable, meaningful and occasionally educational; they say a lot about the person giving them and what they want from you. Personally I like to vandalise them with a few well wishes and a date before wrapping them up. Apparently I am not alone in this habit. 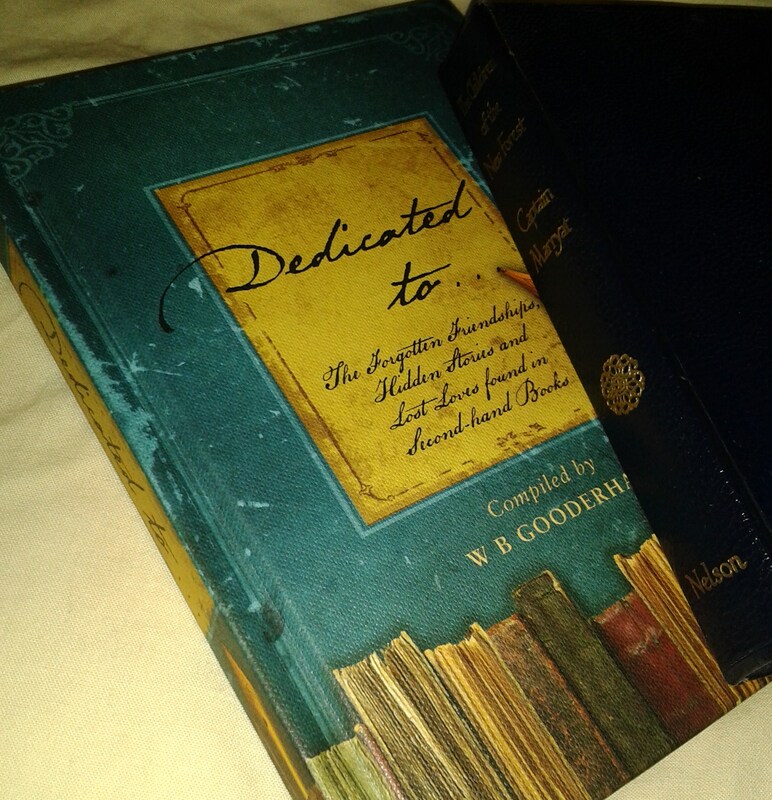 Dedicated to… Compiled by W B Gooderham is, as stated on the cover, a collection of “The Forgotten Friendships, Hidden Stories and Lost Loves found in Second-hand Books”. Gooderham is a bibliophile with a penchant for second-hand book stores. Over years of collecting and buying used books he noticed that the dedications in the jackets added their own stories to the printed ones in the pages. Laid out with a jacket and an inscription on each double page spread the collection totals over 80. There are many more on Gooderham’s blog and he’s still collecting. The books range in age from a few years old to several decades old, some even dating half a century or more. Some dated, some not. Some written with love and affection, some cruel, acerbic and funny. Regardless of the motive the scribbles on inside covers are tiny windows looking onto a specific moment in the lives of two people. We don’t know who they were (most of the signatures are illegible) but there’s a certain intimacy in dedicating a book. Saddest are the unappreciated inscriptions, those published in 2010 or later and have already found their sorry way into a charity bag or second hand store. Wasted words, sentiment thrown to the wind. The reason the book was left behind or deliberately disposed of is a mystery but I like to wonder. A simple misjudged relationship? Or something more sinister perhaps? The older ones are less tragic and often comic. “To John Hughes, Go shoot yourself, Henry, May ’58” adorns in the first page of Jungle Lore. “Mum says it is disgusting: I say it may encourage you to learn the piano. Mum & Dad Xmas 1989” inside a music book of Bawdy Ballads. I particularly enjoyed the romantic, vaguely poetic dedication in Embedded Autonomy – States & Industrial Transformation, Peter Evans. I know neither the giver nor the receiver so the choice of title may be wholly appropriate but an interesting choice for professing love and devotion. Honestly though, this is a stocking-filler book, to be giggled at by guests or as a lazy hour’s entertainment. Or a book for a book lover prone to sentimentality when it comes to gifting printed matter.